During your turn, you can do one of 3 actions. You can look at your own card, you can swap your card with another (or pretend to swap) while not looking at either cards or you can declare you are a character to perform the ability associated with the character. The first 4 turns of the game though, players are only allowed to swap cards. This is to ensure there is some randomness to the game at the start. The main emphasis of the game will be the characters and the different abilities they have. Usually they allow you to swap coins, get more coins, steal coins etc etc. When a player declares a role, each player, in turn order, is allowed to also declare they are the same role. Once everyone has had a chance to declare, all players who have declared will reveal their characters. For those who are wrong, they have to pay 1 coin into the Courthouse as penalty. The player who has the role declared gets to perform the action. So instead of trying to kill each other in Coup, you are trying to accumulate enough coins to win the game. Like Coup, this is a game that requires a lot of bluffing and out thinking each other. Mascarade feels more chaotic than Coup and at times can play longer because you won't be totally eliminated during the game. The art is very nicely done but the cards are rather oversized. However it definitely requires the right group to play and enjoy it. 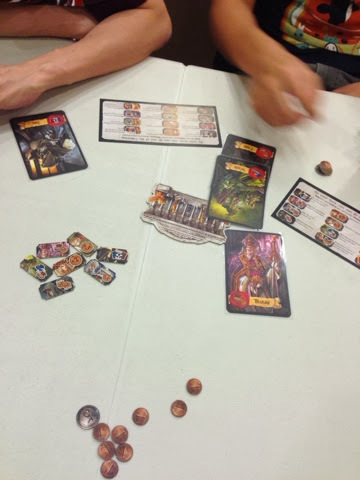 When we first played it at GENCON, we were not really feeling it and perhaps our group was larger so after while things got very chaotic and we could no longer keep track of the cards that were being exchanged like crazy. Second time back in Singapore the group wasn't feeling it as well. Third time during lunch hour and the group I was with was enjoying it quite a bit. We had fun sabotaging each other especially when a player has a grasp of what character he is and we exchange our cards with his. But overall feeling of the game is that its quite chaotic and meh. The overwhelming sense of chaos is the main downer of this game. I think it plays better with less players (maybe 4) but that will mean that we are playing with a fixed set of characters and cannot appreciate the other characters that are provided in the box. There is also a very high potential for stalemate in the game (i.e if everyone just swaps and swaps) or a runaway winner if no one decides to stop the winner by swapping the card away. So all in all, while we were really hoping that this is Coup 2.0, I think it falls short. There maybe some tweaks to make it exciting or requires more plays to be able to see the subtle intricancies of thinking that is required to make it fun. For example you aren't allowed to perform the same action twice in a row. Also if there is a way to randomize the characters to be played that will help in replayability. So if you really want to give this a go, find a good group that knows what it is in for and play with 4 or 5 (not with the 13). Hope you'll like it more next tomes you play it, but however, as the author, I must say that I think this game is best with more or less ten players. With few players, it's easier to more or less track information, and it's more memory than bluffing. With more, you are never sure of what's happening, and it's more about bluffing, psychology, risk taking and sometimes sheer luck - and that's the way I like my games, and I try to make them. thanks for responding and replying. With fewer players, I feel that its a nice balance between bluffing and memory. It has this little bit of pull and tug between the two. With more it becomes somewhat unmanagable and players may not feel its worth the risk of declaring they are the same character as well. Still I started off my gaming hobby with Citadels and while some may complain about it I personally loved the bluffing and pyschology involved with it.